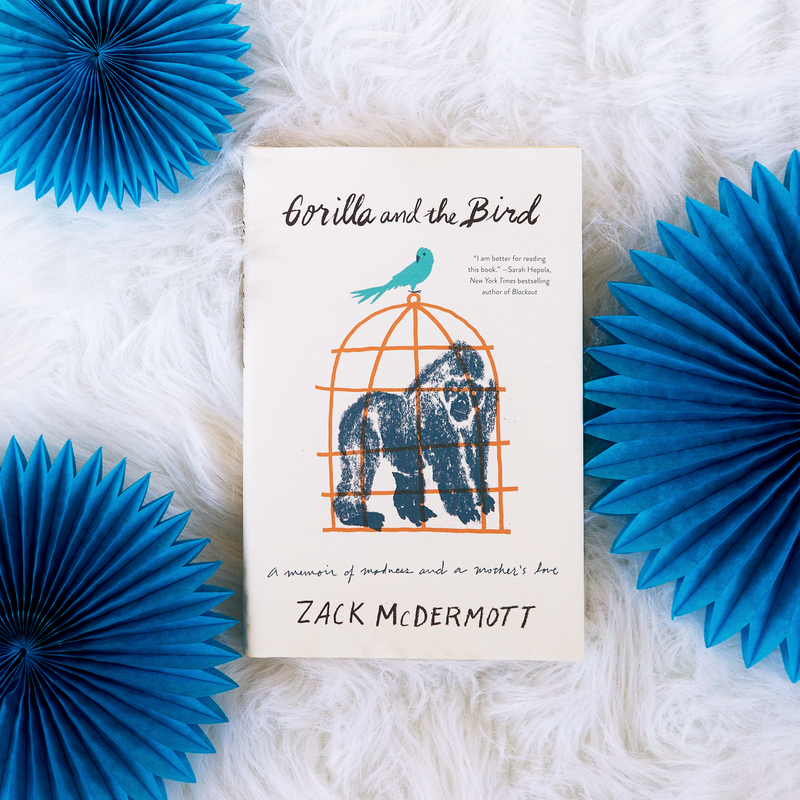 Gorilla and the Bird is so much more than just a memoir about Zack McDermott’s mental illness. This beautiful book is also a powerful statement about the strength of a mother’s love with equally powerful statements about the American judicial system, racial prejudices, the lasting impact of parental neglect, and the importance of mental health awareness and acceptance woven throughout the text. Zack McDermott’s memoir begins with the story of his first psychotic break, during which he (nicknamed Gorilla by his mother, whom he nicknamed the Bird) ran rampant through New York City with the belief that he was being filmed for a pilot for a reality show and that everyone he encountered was part of the show. Throughout the rest of the book, he describes his overwhelmingly stressful career as a public defender, his childhood with a fiercely devoted mother and mostly absent father, the battles his mother fought in order to pursue her passion for educating disenfranchised people (mostly gang members) and the bonds she formed with her students, the clients he represented who had the cards stacked against them almost from birth, and the ways he dealt with his Bipolar Disorder and psychotic breaks, which included stays in psychiatric hospitals. I’ve never stood on a subway platform and not thought about what it would be like to throw myself in front of what’s coming. But I found myself standing a few inches closer to the edge, listening a little more closely to the question that the train was asking of me. I knew I wasn’t going to stick my neck out on my own, but what would I do if a kid on a scooter bumped me from behind? I was pretty sure I would tighten my core and push back with the full force of my hamstrings at the first brush of contact. But I was less sure than I’d ever been. So I guess I was approaching something like fairly suicidal. But do you get to claim that if you’d never cut, jump, or load the gun? Feels a bit dramatic. For all the lip service people in my office pay to the notion that mental illness is no different than cancer or diabetes, I couldn’t help but think that Teresa from the immigration unit probably wouldn’t have been sent packing after returning from chemo if she’d forgotten her note. Would they even have asked her for a note or would her new short hair and the fact that she was standing upright be proof enough that she was fit for duty? The note rule didn’t feel like the fulfillment of a bureaucratic requirement; it felt like a request for proof of sanity. McDermott made an incredibly important point about the way mental illnesses are viewed by others. His book is one that brings valuable awareness to the idea that mental illnesses are still viewed differently from nearly all other illnesses, despite the fact that they are no more of a choice than anything else that manipulates some aspect of our internal chemistry. Another important element to Gorilla and the Bird that made me want to shout its virtues from the rooftops is the Bird herself, McDermott’s mother. As a mother myself, I understand the depth of the love she has for her children, and I know why she was willing to drop everything in her life to be there for McDermott when he needed her. But, my goodness…the Bird has to be one of the strongest women I have ever encountered in a work of nonfiction. McDermott doesn’t necessarily write about her with overflowing praise, but by simply telling his readers about the things she did for him and the passion she has for helping her students in the classroom AND in life, readers can’t help but see that the Bird is a truly remarkable woman with a backbone of steel and a heart of gold. This isn’t to say that she’s perfect. The Bird has flaws and makes a few bad decisions along the way, just like anyone else, and McDermott never tries to portray her as the perfect mother. However, readers still get the sense that there could never have been a more perfect mother for McDermott than the Bird. Throughout his discussions of his own mental illness and the Bird’s dedication to helping others (especially him), McDermott also makes important points about our country’s justice system. As a public defender in New York city, McDermott’s clientele includes illegal immigrants, drug addicts, repeat offenders, homeless people, and those with mental illnesses…just to name a few. McDermott’s choice to pursue his particular line of work, which pays much less and involves much more stress than his classmates in law school who pursued private law instead, put him in a very unique position with his clients. Through the students of his mother’s that he knew when he was younger and his own experiences with mental illness, McDermott is able to see the injustices of his clients’ situations in a way that many of his colleagues can’t. His empathy for people that many others would immediately write off is incredibly admirable and caused me to look at our justice system in a different way myself. While telling his story, McDermott approaches the difficulties he has faced with a sense of humor that makes readers chuckle…and then immediately feel guilty for doing so…but the fact that he is able to talk about his journey in such a way proves that he has chosen to laugh at himself instead of lash out at everyone around him, as many others might have done. Meanwhile, he has used his story to help bring awareness to a wealth of different issues. Just…read this book. Not only is it absolutely fascinating, but it’s incredibly enlightening and compelling. Read it. Go on. READ IT! Posted in NonfictionTagged gorilla and the bird, memoir, mental illness memoir, nonfiction review, zack mcdermottBookmark the permalink.